Needed to calculate design flow for treatment system sizing. This can only be used in a location where all of the water can be caught with a bucket. Usually to use this method a pipe needs to be installed so that all the water can be captured. Find a bucket with a known volume (gallons). With a stopwatch, time how long it takes to fill that bucket to the known volume. The following formula is then used to determine the flow. Weirs are typically made out of wood, metal or plastic with a v-notch or rectangular notch in the top. The v-notch is usually 90º. 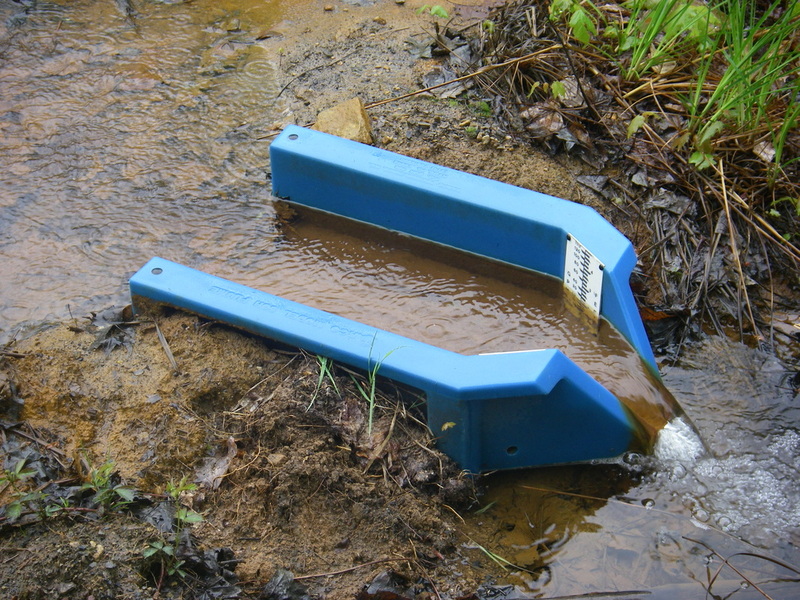 The opening sizes for a rectangular weir are usually in1 foot increments. Sufficient room is required upstream of the weir so that pooling of the water can be created. It is critical that the top of the weir is level. The water level (head) must reach a steady level upstream of the weir. This head is what is measured to determine the flow. There are many tables that can be used to determine flow in gallons/minute or cubic feet per second once the water level going over the weir is known. These are open-channel flow measuring devices that restrict the channel area and/or change the channel slope. This results in an increased velocity and a change in the level of the water flowing through the flume. 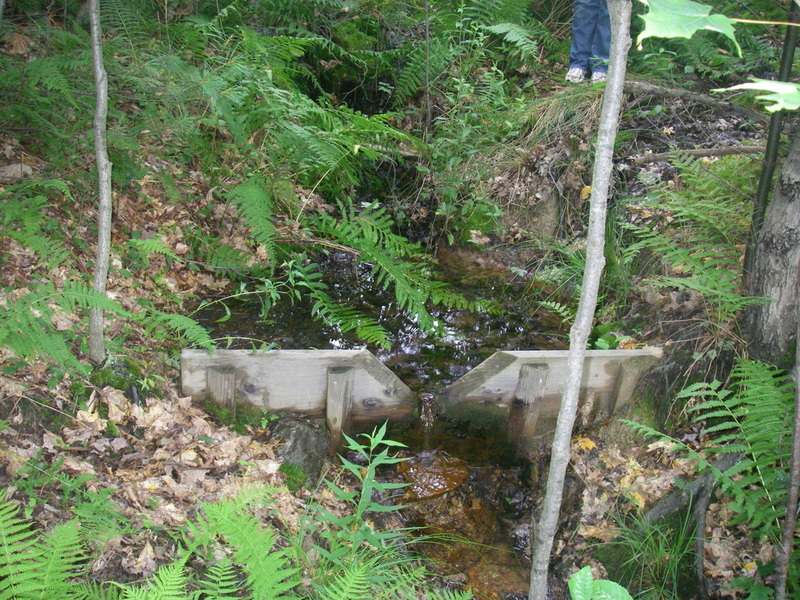 The flume must be level but does not require damming of the stream behind it. There is a scale in the flume that indicates how the level of water corresponds to a flow measurement in gallons per minute. A flow or current meter is needed for this method. 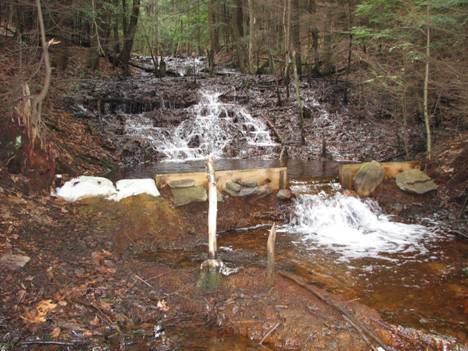 A uniform section of stream needs to be chosen that is free of as many obstacles as possible. A measuring tape is stretched across the stream. Then starting at the water’s edge, depth of the water and velocity of water is taken with the flow meter in sections along the tape. The width of the sections are also recorded. By using the flow meter datasheet, the discharge of the stream in gallons/minute can be calculated. Constant: Multiply by 0.8 for gravel or rocky bottom streams or 0.9 for sandy or muddy bottom streams. To convert flow to gallons per minute take the discharge and multiply by 448.8. Standard tables or formulas can be used to determine flow. See below.